Welcome to Bargain or Just Cheap? 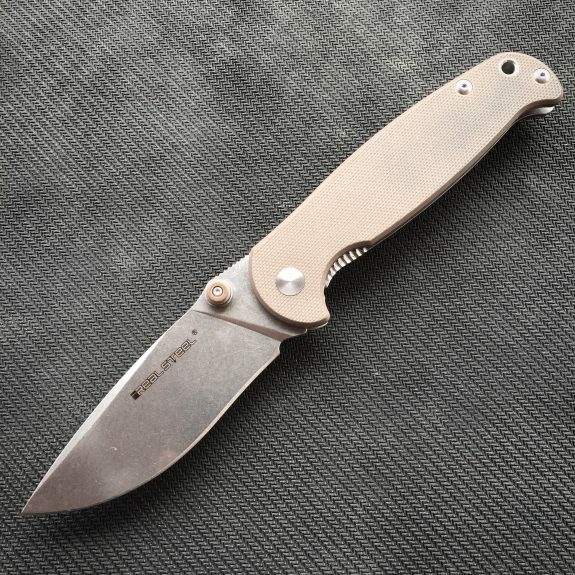 This series will review budget friendly knives for a variety of uses in a short format. All of the knives will cost less than $50 (in most cases, much less) and will be purchased out of my own pocket. I’ll buy them, carry them, and use them in an attempt to determine if the knife is a bargain or just cheap. I have always been very leery of Chinese knife manufacturers due to their historically poor quality and penchant for knock-off designs. A friend cautioned me about throwing the baby out with the bath water and introduced me to a several Chinese knife manufacturers that are worth a look. One such manufacturer is Real Steel and their H6-S1 is the subject of today’s edition of Bargain or Just Cheap?. Real Steel offers several variants of the H6 but there is one that I believe really stands out – the H6-S1. This knife floored me with how good it is for the price. This knife is exceedingly likeable. It is at the upper end of our $50 price limit but it is dripping with great features, hallmarks of quality, and functional design. The 14C28N is a step up from the blade steel found on many Chinese knives or any budget knife for that matter. This Sandvik steel is easy to sharpen, takes a polished edge VERY well, and holds it well enough for EDC tasks. I was very happy to see a Sandvik steel being used here. The drop point, slightly recurve blade has plenty of spine and features a full flat primary grind. It cuts and slices very well. The handle is well contoured and comfortable with more than enough room for all your fingers. Both the G-10 and the steel lock side of the knife are thick and sturdy but overall the knife feels and carries very slim. Speaking of G-10, the thumb studs are actually machined G-10 that matches that handle color. They are large and easy to operate. The knife opens easily and smoothly with a flick of the thumb without even having to use your wrist. The lock on my example is excellent. It looks up with about 60% engagement so it is very sturdy with room to wear in over time. The lock bar features a very unique and very cool feature. 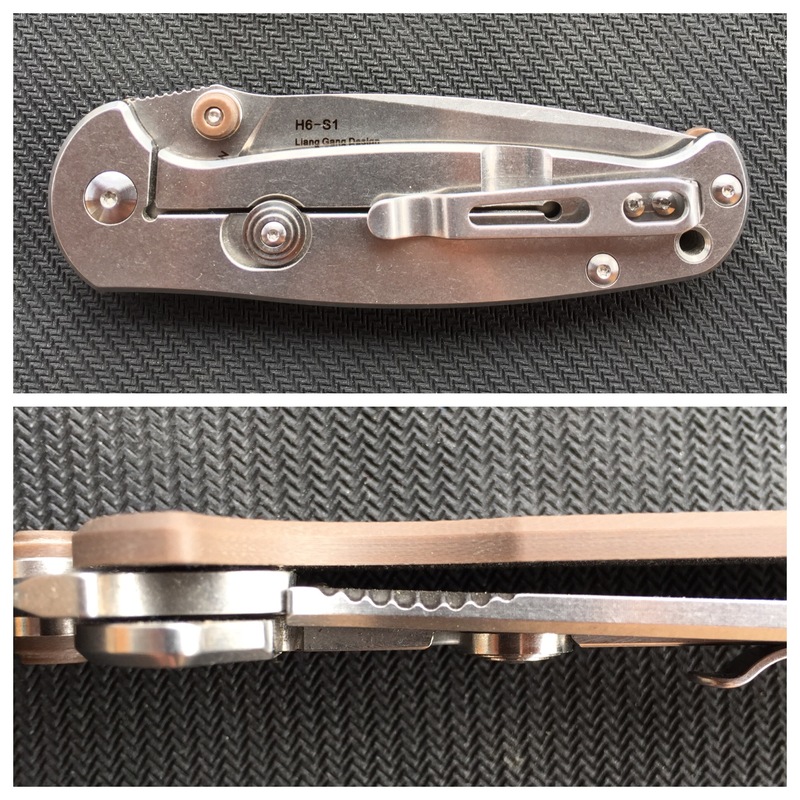 It has a disk that at first glance looks like any Hinderer style lock bar stabilizer (a small stop designed to prevent lock bar over travel). Closer inspection reveals the fact that it can be pushed forward into a second position that actually blocks the lock bar from moving completely! In this position, the knife can not close on your hand without some kind of catastrophic breakage. The disk locks in each position with strong detent action so it is extremely unlikely that you will accidentally activate or deactivate it. This knife is impressively light for a knife of these dimensions. There is some milling on the inside of the steel handle scale to remove weight. A full height flat grind also reduces weight as does a liner-less G-10 handle scale. It is larger in every dimension than the previously reviewed Kershaw Emerson CQC-4K yet it weighs less! 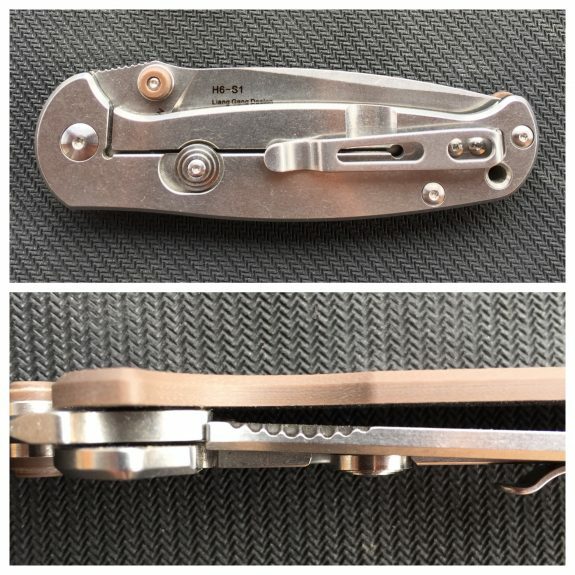 The pocket clip isn’t a true deep carry clip but it does place the knife very low in the pocket which is nice for professional settings. It is very stout and holds the knife securely. The fit and finish of this knife is very good. It has better than average steel, better than average materials, clever features, and a very functional design. It also happens to look great! It gives the impression of quality. I’ve seen them as low as $40 but they usually average around $45 for most variants of the H6. Honestly, I would feel good about this knife at twice the price. There is nothing cheap about this knife other than the price. The Real Steel H6-S1 is most certainly a Bargain. Note: There are a number of H6 variants and colors available. The features vary significantly from variant to variant. Be sure you are buying the H6-S1 if want the features shown in this review. Our goal is to represent knives for a variety of uses from EDC, to outdoor, to tactical knives. Do you have a favorite affordable knife? Let us know about it in the comments! This is a great and fun series. Thanks for doing this!